Being a Stampin' Up! Demonstrator, it would be very easy to buy all the fabulous sets we have to offer. However, for myself and many of my customers, that simply isn't possible. To limit my "must have" list, I set a guide line for myself. Basically, if I can't use a stamp set five different ways, it's not for me. Over the next few days I'm going to showcase Kindness Matters. This super sweet set can be used so many ways and I wanted the chance to highlight some of them. It's a great beginner set as you can create so many different pieces with it, both masculine and feminine. The first card I'm going to share is a "shadow box" card I created. It's hard to tell from the photo, but there is actually a piece of acetate over the top of the image to make it look like it's in a shadow box. To learn more about the great projects you can make using Kindness Matters book a workshop or sign up for one of my monthly classes. 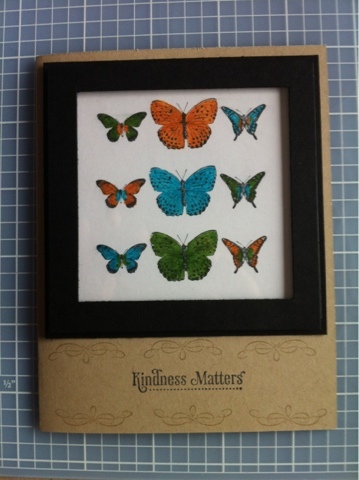 To order your Kindness Matters set, email or call me, 289-280-0304. You can also shop online 24/7 by simply clicking the Stampin' Up! logo at the top of the page.